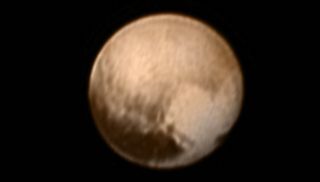 New Horizons captured this image of Pluto on July 7, 2015, when the probe was just less than 5 million miles (8 million kilometers) from the dwarf planet. Pluto looks especially welcoming in a new photo by NASA's approaching New Horizons probe. The image, which New Horizons took yesterday (July 7) when it was less than 5 million miles (8 million kilometers) from Pluto, shows a large, heart-shaped feature on the dwarf planet's surface. The bright "heart" is about 1,200 miles (2,000 km) wide, NASA officials said. To its left lies an 1,860-mile-long (3,000 km) dark patch along Pluto's equator that mission scientists are calling "the whale." New Horizons should get much better looks at both of these intriguing features in the coming days — especially during its July 14 flyby, when the probe will zoom within 7,800 miles (12,500 km) of Pluto's surface. "The next time we see this part of Pluto at closest approach, a portion of this region will be imaged at about 500 times better resolution than we see today," Jeff Moore, New Horizons' geology, geophysics and imaging team leader, said in a statement. "It will be incredible!" added Moore, who's based at NASA's Ames Research Center in Mountain View, California. The image is the first one to come back down to Earth since Saturday (July 4), when New Horizons suffered a glitch that briefly sent it into safe mode, NASA officials said. The spacecraft is now back up to speed, and has in fact begun its close-approach science operations — a choreographed sequence of observations that lasts nine days. This map of Pluto, made from images taken by New Horizons from June 27 through July 3, shows a diverse array of bright and dark markings, including “the whale,” the large, elongated dark patch at bottom left. "The whale" also features in New Horizons' latest color map of Pluto, which is based on photos New Horizons took from June 27 to July 3. The map reveals a bright, 200-mile-wide (320 km) ring-shaped feature lying just above the whale's tail. The doughnutlike feature resembles impact craters and volcanoes seen on other solar system bodies, but mission scientists will wait for more detailed images before they begin a serious attempt at interpretation, NASA officials said.